Perhaps the oldest known type of arthritis, gout or gouty arthritis, has a long and colorful history with some of the earliest descriptions dating back as far as the 5th century B.C. Historically, gout as been called “the disease of kings” due to its association with rich foods and alcohol consumption. However, in 2011 we know that gout does not discriminate based on socioeconomic status but rather it is directly related to uric acid metabolism. Gout is an inflammatory arthritis that belongs to a group of arthropathies called the ‘crystalline arthropathies’. Gout is caused by a robust inflammatory response to uric acid crystals which occurs in the setting of hyperuricemia (high uric acid levels in the blood). Supersaturation of uric acid can lead to crystal accumulation and deposition in the joints and tissues to which the immune system reacts. Uric acid tophi (which occur in tophaceou gout) appear as hard nodules under the skin and can cause considerable destruction and discomfort. The association between gout and uric acid has been known since the 19th century, but it is the important developments in our understanding of the careful uric acid homeostasis that has led to effective therapy for gout. Today, gout remains one of the most treatable forms of arthritis. 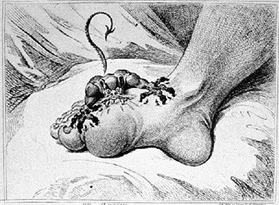 “The Gout” by James Gilray, 1799. Gout depicted as an evil demon attacking a toe. “By Royal Authority” by George Cruickshank. 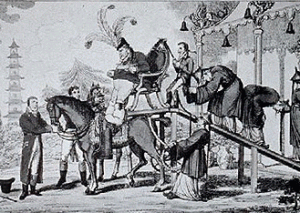 A gout sufferer helped onto his horse. Dr. Albayda introduces gout, its symptoms, treatment options and lifestyle choices for those with the disease.